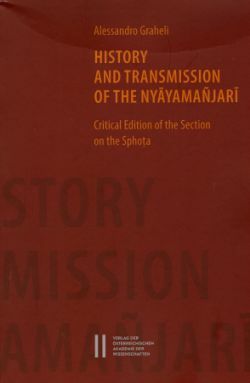 Critical Edition of the Section on the Sphoṭa. is at present the principal investigator of a project dedicated to the translation of the Nyāyamañjarī at the Austrian Academy of Sciences, Institute for the Cultural and Intellectual History of Asia. The Nyāyamañjarī was composed in Kashmir, in the ninth century CE, by Bhaṭṭa Jayanta. It is a compendium of theses concerning ontological, epistemological and linguistic issues developed in the classical period of Indian philosophy. Jayanta’s approximate date is confirmed by both internal and external evidences, so the Nyāyamañjarī has become a landmark in the historiography of Indian philosophy. Despite its relevance, however, the history of the textual transmission of the Nyāyamañjarī is in many respects still unknown. This new critical edition is based on a comprehensive inventory of all the known sources, on a detailed description of the manuscripts, on a textual bibliography of the printed editions, on a genealogical study of the textual transmission, and on a rich apparatus of the indirect transmission. An important result of this research has been the development of a new, rigorous, and yet pragmatic method to edit Nyāyamañjarī passages, without the demand of formidable resources in terms of time, man-power, and funds. The first part of this publication includes all the propaedeutic steps in view of the critical edition. More specifically, it consists of the recensio of the known Nyāyamañjarī sources, including their inventory, their description, the collation of their variants, and the study of their genealogy, resulting in a fully documented stemma codicum which guides the editorial choices during the reconstruction of the edited text. The second part contains the critical edition, which covers the first of the three sections composing the sixth book of the Nyāyamañjarī. This particular section consists of a discussion on semantics and epistemology from the perspective of the Vyākaraṇa, Mīmāṃsā and Nyāya traditions, hinging around the holistic theory of the sphoṭa.